VpCI-386 is a unique water-based acrylic primer/topcoat that successfully provides protection in harsh, outdoor, unsheltered applications. The complex mixture of nontoxic organic inhibitors offers protection that can compete with most paints and zinc-rich primers. VpCI-386 is superior to many coatings with inorganic pigments because the resistance has been improved by replacing pigments and metal oxides with more effective organic corrosion inhibitors. The special combination of additives provides a composite polymer barrier that significantly retards the reaction of metal ionization. A protective film is adsorbed onto metal surfaces. It protects against corrosive electrolytes and aggressive environments; preventing corrosion. VpCI-386 provides a fast-drying thixotropic coating that is resistant to sagging or running, forming a tough, non-flammable, protective barrier. This dry-to-touch film offers extended protection for outdoor or indoor conditions. Thermally stable when dried from -150°F to 350°F (-78°C to 180°C). The coating is ultraviolet resistant giving optimal outdoor performance without cracking or chipping upon prolonged exposure to sunlight. This product can be used as a topcoat/primer. When solvent-based topcoats are applied over VpCI-386, compatibility must be checked. These can also be used as a topcoat with Cortec® VpCI-374 as a primer. Note: Make sure dew point is more than 5°F (2°C) less than air temperature for application. Power agitate to a uniform consistency using a “squirrel cage” type mixer, hand-held drill mixer, or other equivalent method. VpCI-386 can be applied by spray, roll, brush, or dip. *Use a coat of VpCI-373 green before using VpCI-386 on galvanized. Hose should be 3/8" (0.95 cm) I.D. minimum, but a ¼" (0.64 cm) I.D. whip end section may be used for ease of application. A maximum length of 100 feet (30.5 m) is suggested. Best results will be obtained using a 0.013”-0.017" (0.3-0.4 cm) tip at 1200-1700 psi (83-117 bar). 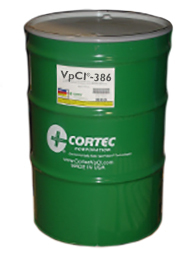 Available in 5 gallon pails (Cortec Product # 12400047) or 55 gallon metal drums (Cortec Product # 12400048). 5 gallon drum weighs 50 pounds and ships under our standard shipping rates. The 55 gallon drum must be shipped by truck. We will provide you with a freight quote before we ship this product. Do not store product in freezing temperatures.